Hi! I hope i posted to the right section and please excuse my poor writing as English isnt my main language. As ive taken up on sanding the floors on an apartment i just got ive got a few questions. The house is from 1958 and the floors were an utter mess. I needed to use 16 grit paper and it took 2 full days to get it level. It was covered with paint and spackle. The boards were cupped and uneven. The thing is i still have 3 more grits to go before im finished but i need to take the large sander back to the shop tomorrow. So is it okay to sand the center to 80 and do the edges later? It it okay to leave the floor unfinished without any oil or laquer for 4 months? Cause i plan to do that step the last in my whole construction schedule. In this picture you see that there is this long streak of paint on a board right near where the door is that the sander isnt taking off due to it being so uneven. Even with 16 grit i cannot seem to make a difference there... what are my options? Should i deal with that spot individually with a hand sander? 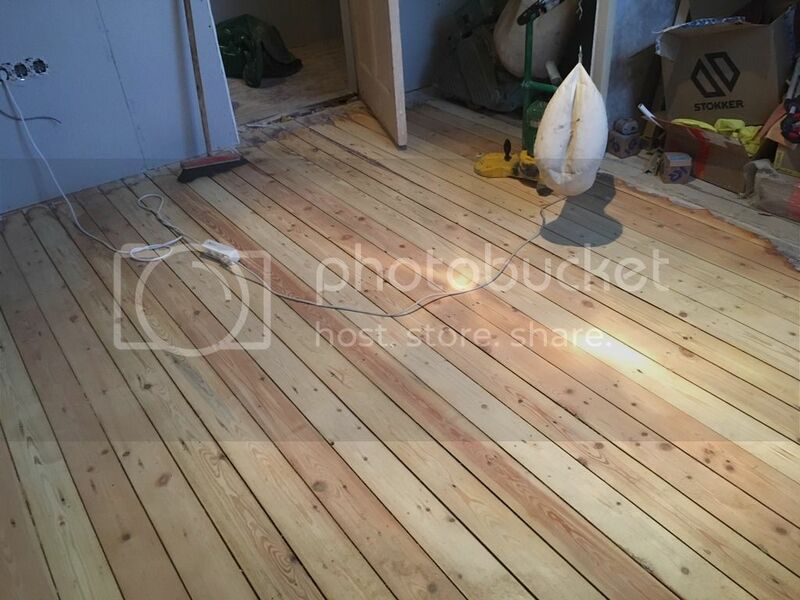 Sanding at a slight angle will help flatten the floor. Sometimes you will need to scrape a low board to get it clean. After you finish sanding with the big machine you should only need to give the edges a fine sanding. With practice you can do a good job even through the big sander has finished before the edging has started. Spot sanding around a low area can be a good solution so the floor is relatively smooth, but not completely flat. When you take the big sander back you may want to rent a 16 inch buffer and buy a white pad and either 80 or 100 grit screen. I would recommend using both. This can help blend the edges, using 80 after the edging. the 100 grit can save time preparing the first coat of finish after it has dried. It will be rough from grain raise and need to be smoothed, but you can also use 100 grit paper and hand sand the whole room. I always hand sand the grooves with either 50 or 60 grit before finish and then 100 after the finish coats have dried. So i will finish the majority of the room with the big sander to 80 grit, take the machine back. Get the edges done and then when im ready to finish with Osmo Wood Wax il go over it with a 100 grit? Do you have the Osmo already? Some penetrating oil/wax finishes recommend sanding to 120 grit. Most film type finishes say sand to 100. You want the floor smooth so it is easier to remove the excess so it won't get gummy or take a long time to harden.